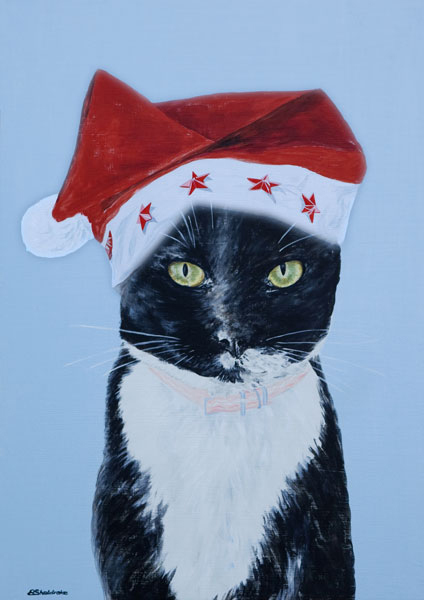 "This painting was one of two designs donated to the SOS Algarve Animals Charity for their 2014 Christmas Cards. The charity relies entirely on donations and support for their much needed sterilisation campaigns to street animals and animals at risk of getting pregnant. They also operate a re-homing centre and have dogs, puppies, cats and kittens all in need of new loving forever families. They are a registered charity here on the Algarve doing valuable work to protect animals - so you can rest assured that all the profits from the Christmas Cards will be well used"
The cards are large A5 size luxury cards printed on high quality paper with nice envelopes! There are 2 designs to choose from - Molly the cat or Harvey the dog! Postage costs will be added according to your location in the world. To order them you can just e-mail the charity direct and they will arrange payment and postage for you.